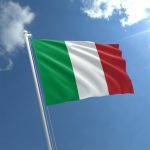 With a debt-to-GDP ratio of 132% (third highest in the developed world), a dismal economy, weak banks, a non-functioning euro-skeptic government that wants to vastly increase the deficit, now add the possibility of Quitaly, Italy quitting the euro! The Italian bond market nosedived as investors ran away, the euro fell, and global equities collapsed. Worse, the upcoming elections will be a referendum on Italy’s euro membership. Fasten your seatbelts.